The annual Jaycee event was all free, and featured a visit with Santa, a picture, cookies, Christmas music, hot cocoa, and other surprises. Santa, better known as Jaycee Fred Badger, and Jaycee Laureen House played Mrs. Claus, dressed in a fashionable head-to-toe red snow suits. The temperature had thankfully warmed up from the bitter 19 degrees the night before. 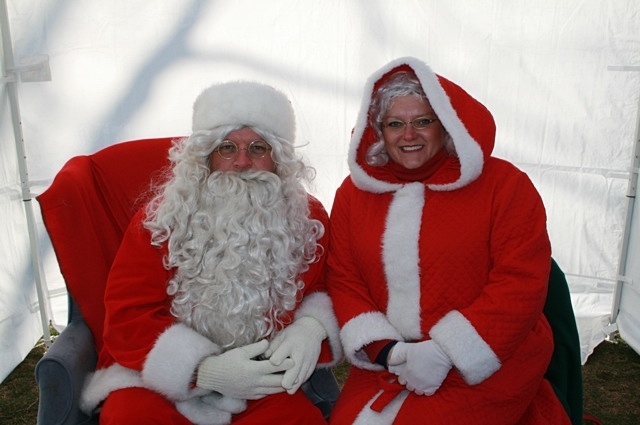 Hypothermia concerns aside, the morning was a great success, as Santa and Mrs. Claus listened intently to each child. More expensive electronic gifts such as the new play station games seem to be popular choices this year. Badger says he has lost count of the number of years he’s played Santa (it’s well over a decade), but it’s clear he still enjoys the role. With all of the children, he took the time to talk to them, listen, or just wait a few more seconds for a parent to take another picture or video. Laureen House is a perfect Mrs. Claus and greets the children with such a wide smile and loving affection that you really believe she’s the real Santa spouse. “I love this project.” She said. This year’s chairman, Lynda Walsh, said that this event is one of the ways the Jaycees say thank you to the community. “We appreciate your support of the Jaycees throughout the year,” she said, adding that the Jaycees are very happy to bring Santa to the Common each year. Matt Hebert, who also assisted that morning, was a great help, handing out free hot cocoa and cookies and helping ensure the event ran smoothly. The Jaycees estimate about 150 children saw Santa before he left at 2:00, heading back North for final preparations for his big trip on Christmas Eve. December is a particularly busy time for the Jaycees, with Christmas tree sales (this year at the Invensys lot), the kids Christmas party, Santa on the Common, assisting with the food deliveries, their own progressive dinner, Santa Phone, and many other community activities.